Scientists from the University of Nevada and their partners at Scripps Institution of Oceanography in San Diego have been studying the bottom of Fallen Leaf Lake. They have found standing trees up to 130 feet beneath the surface of the lake. Using remotely operated submersibles, scientists have determined that the trees grew and matured there. This means the lake level was 130 to 200 feet below the existing level. The reason for the low water level can only be attributed to a megadrought. 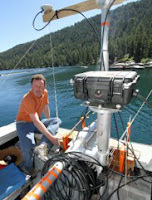 Scientists can analyze the standing submerged trees, sediment cores, and the ancient shorelines to more accurately and easily trace the precipitation history of the Lake Tahoe region. The research shows that megadroughts occur every 650 to 1150 years and the last one was 750 years ago. Scientists now wonder how “climate change” will affect the timing of the next big drought.